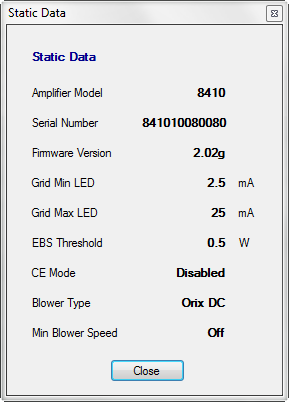 Originally, the Alpha 8410 Monitor was a Windows application used to parse and display the telemetry available from the 8410. This alleviated the need to capture raw telemetry in a terminal emulator log file and try to make sense of it in Excel or some other tool. What the amp didn't provide via telemetry I had the monitor calculate for as comprehensive a view as possible. The monitor has evolved significantly and now provides limited remote control as well as display of telemetry. Remote control includes power-on and power-off, STBY/OPR switching and selecting what the front-panel multi-meter LEDs display. This is an example of the display during transmission with the amp in the G1 V2 bias state (i.e. full-on, no EBS back-off). Everything in the 'Parsed Data' and 'Static Data' sections comes directly from the telemetry strings (shown just below the buttons). 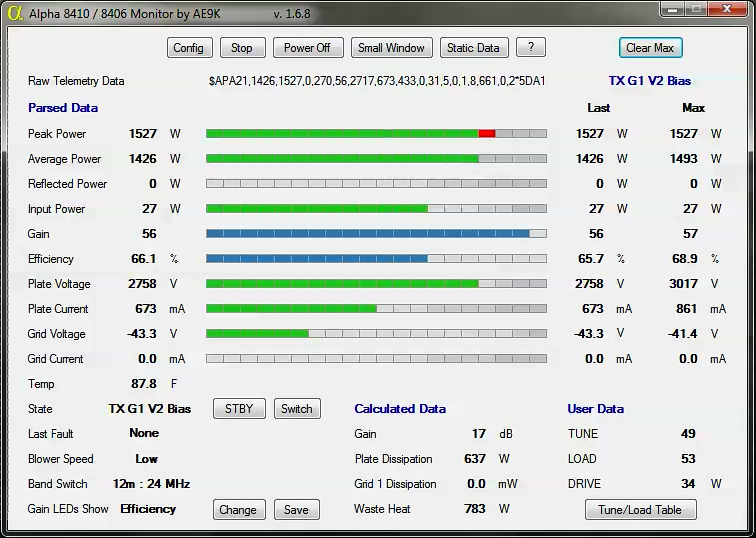 The calculated data is derived from the telemetry data based on simple calculations. The 'TX G1 V2 Bias' section on the right keeps the last and maximum parameters seen during the TX G1 V2 bias state. This is full-on with no EBS back-off (the latter being the G1 V1 bias state). 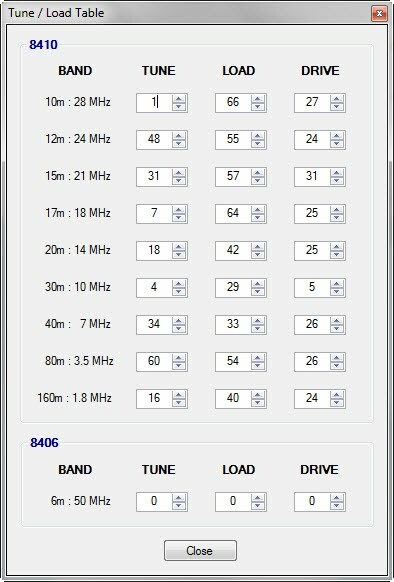 I thought this was useful to persist as the G1 V2 bias state is really what matters when tuning up. There's a Clear Max button so you can catch a maximum, fiddle with TUNE/LOAD or drive power then get the next set of maximum values. The grid current values persisted in the TX G1 V2 section are also helpful because grid current is so fleeting you may just see a flickering GRID MIN LED on your amp front panel and have no way to know how much. Once you've experimented with this and your amp settings, you may not want all of this screen real estate wasted so I provided the option to switch to a smaller window with just the most important data elements shown. 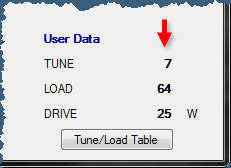 The Tune/Load table allows you to store within the monitor the tune and load values you'd otherwise have written down - something to find each time you want to change bands. Some people tape a small table to the front of their amp. My tune/load sheet was always barely out of reach of my headphone cable so I thought it would be really handy to have it built into the monitor. There's an option to highlight the these values when a band change occurs so it's easier to see that you need to re-tune. Once done, just click the highlighted area to make the warning go away. Out of all the bells and whistles I get more use out of this simple capability. All the static data is also available for display. This screen serves several purposes but primarily it's where you can see the version of firmware you're running - especially helpful after an upgrade to make sure it shows the new version. The monitor is written in C# using Visual Studio 2015 and implements a "WinForms" user interface. The monitor installer will check for the presence of the .NET framework 4.0 and will install it if it's missing. The monitor is developed on a Windows 10 Pro laptop and is tested with Windows 8.1 and 7. It is no longer tested with XP but did work with XP at least through version 1.7.0. Now that XP is beyond End of Life, no further XP testing will be done. The monitor and installer are compliant with User Access Control (UAC) first introduced in Windows Vista. This means program files are stored in an appropriate program files directory and user data files (configuration, fault logs, EEPROM dumps, etc.) are stored in the user's profile. Co-mingling of program files and writable data does not occur. The monitor can wrap the RF Concepts Colt boot loader. This allows the user to specify the location of the loader once and let the monitor remember where it is and to make sure the monitor isn't using the serial port the loader will need to use. While I originally built the monitor for my own needs based on limited telemetry documentation and my own observations, a lot of the features weren't possible without cooperation from former Alpha staff members - particularly Gordon Hardman. Constructive input during monitor development and his rapid turnaround on firmware changes in support of monitor features were a tremendous help. My thanks to Gordon and Joe Jurneke. Check out the reviews on eham.net and consider writing your own. Drop me an email with feedback and comments.